ETP Studio for FIX is the only toolset you will ever need to test your FIX connectivity. Simple to deploy and simple to use. It is designed with simplicity in mind so you can carry out FIX testing in almost no-time at all. It is also designed to satisfy the requirements of demanding technical users requiring powerful and configurable testing commands. Whether you are a QA tester, a developer or in the FIX on-boarding team, you will find your perfect toolset in ETP Studio for FIX. With its modular architecture you only see the tools you need, leaving all other complexities out. Or you can power-up your toolset by adding plug-ins with advanced testing features. Achieve complete regression testing of FIX sessions before every release. Connect and test individual services provided by different business modules. Exercise 100% of your business functionality, across the trade lifecycle and trading functions. Verify functionality verticals provided through FIX and across business areas. Test the integration of FIX-enabled systems within the trading architecture. Verify trading limits, fail-over scenarios, authorized transactions and mission-critical capabilities. Check out the list of features in ETP Studio for FIX or download a brochure from the right-side menu. Check out this non-exhaustive list of more than 50 features available in Esprow ETP Studio for FIX. Manage all FIX dictionaries and rules of engagements from one single location. Share them with your team and store them in source control. Start ETP Studio up and begin testing. 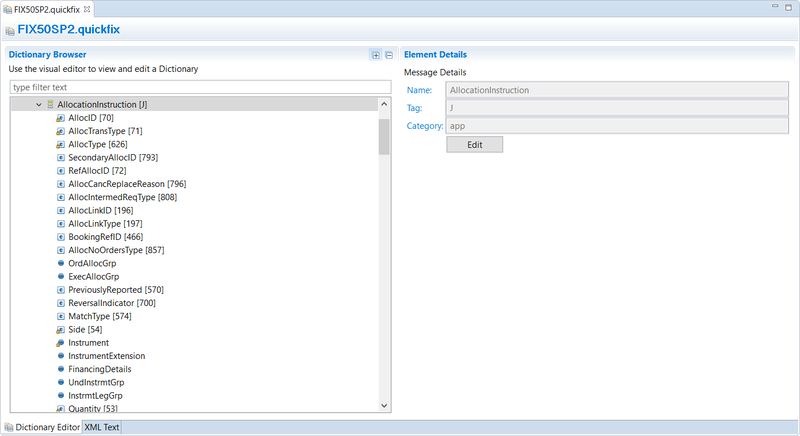 Open a session and send messages to it, sourcing them from templates or from log files. A powerful set of reporting features covering test specifications and test results. Leverage smart wizards that automatically generate test unit or simulators from your production log files. The industry most powerful and easiest to use editor to build FIX tests and simulator, but also to run and debug them. With ETP Studio modular architecture your toolbox keeps growing at every release with new exciting plug-ins. ETP Studio uniquely supports multiple concurrent FIX sessions, multiple concurrent protocol connectors and message rates up to 20K msg/sec. ETP Studio integrates seamlessly with databases, source control systems, continuous integration systems, and more. Leverage Esprow's engineering services and expertise to carry out your migration seamlessly. 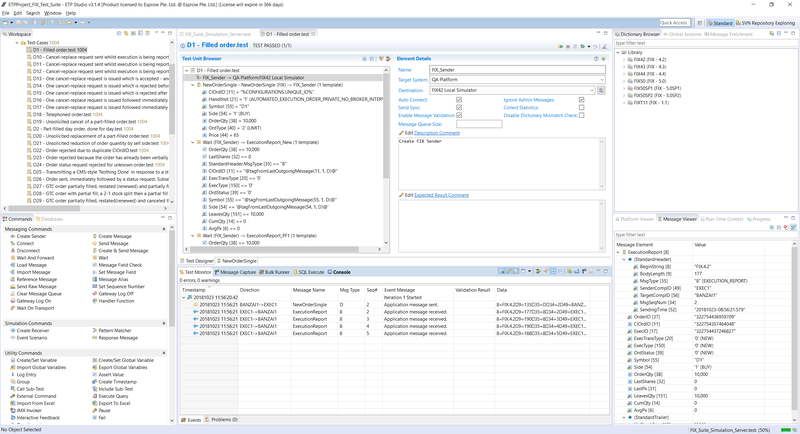 Regardless of which FIX testing tool you are currently using Esprow Engineering Services can seamlessly migrate your existing suite of test scripts to ETP Studio for FIX. For some third-party products we are able to automate the migration and deliver your migrated test base within days. In other circumstances our Engineering and Professional Services will collaborate with you to plan and execute the quickest and most cost effective migration strategy. Don't stop at FIX - ETP Studio Multi-Protocol offers the same powerful features of ETP Studio for FIX but across a wider range of financial protocols and trasports, including internal proprietary protocols and codecs. There is no better tool for end-to-end system testing across the enterprise.